There were 447 press releases posted in the last 24 hours and 153,723 in the last 365 days. 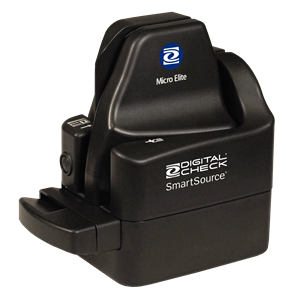 /EIN News/ -- Northbrook, IL, April 16, 2019 (GLOBE NEWSWIRE) -- The SmartSource Expert Micro Elite is Digital Check’s newest intelligent check scanner, bringing full network-addressable functionality to a compact single-feed model for the first time. The new device, which makes use of the recently developed SecureLink 2.0 network protocol, is available immediately. The SmartSource Expert Micro Elite check scanner is a network-ready version of the Micro Elite, with a compact form factor and more onboard processing power. As Digital Check’s first single-feed scanner with network capabilities, as well as an optional single line endorser, the Expert Micro Elite is an affordable device intended for remote deposit capture or specialty branch uses. It is ideal for banks and businesses using thin-client workstations or virtual desktop environments. SecureLink 2.0 allows banking applications to address a scanner from any device on a network, including PCs, handheld devices, and touchscreens. Thanks to this new API, SmartSource Expert Elite and Expert Micro Elite scanners can be operated using a standard web browser-based or conventional application. The Expert Micro Elite is based on the popular SmartSource Micro Elite scanner, which boasts one of the smallest form factors of any dedicated check capture device. At roughly the size of a large coffee mug, the Micro Elite is used by thousands of banks and remote deposit capture customers as an affordable MICR-enabled check capture solution. The Expert Micro Elite adds Ethernet hardware and enhanced processing power to run key functions onboard the scanner itself – giving it the minimum PC installation profile and rendering it operating-system independent. SecureLink 2.0 is Digital Check’s next-generation networking technology that brings certain network-ready SmartSource scanners onto the same platform as the company’s TellerScan and CheXpress models for the first time. It is available as a built-in option for SmartSource models, or as a standalone hardware device that can connect both new and already-deployed TellerScan or CheXpress scanners to a network. For more information about the SmartSource Expert Micro Elite, or about SecureLink 2.0, please contact your Digital Check representative or visit www.digitalcheck.com. Digital Check is the leading worldwide provider of check scanners and peripherals for the banking industry. Our TellerScan®, CheXpress®, and SmartSource® lines of scanners provide the industry’s most reliable performance with superior MICR and image quality. Digital Check has a rich history in scanner networking that stretches back more than a decade. Learn more at www.digitalcheck.com.